Trying to make San Diego’s roads safer for people on bikes can seem daunting. Who has the time to attend every public event where changes to your neighborhood’s streets are being considered? From city and SANDAG meetings that take place while we’re all at work, to community planning meetings and bikeway open houses that occur on busy weeknights, it’s nearly impossible to consistently make your voice heard. Meanwhile, there are powerful forces in our communities actively working against your safety and the taxes you pay for it. In Hillcrest, three years of public input on the SANDAG Uptown Bikeway was disregarded when the Hillcrest Business Association successfully lobbied SANDAG and the city to eliminate most of the project from University Avenue. Remember, this project is paid for with your TransNet sales tax dollars. Yet the HBA was able to raise tens of thousands of dollars using funds from the Hillcrest Farmers Market and business donations, and this money is still being used to kill the rest of the Bikeway. So even when your voice is heard, it’s being drowned out by powerful, politically-connected interests that put street parking over your health, safety and tax dollars. For me, the best way to make sure my voice actually has an impact is to support BikeSD. That’s because BikeSD’s executive director, Sam Ollinger, is the best resource we have in San Diego to create positive change. I’ve seen Sam speak numerous times at public meetings and there is no one more knowledgeable and effective at making our case than her – period. And when our safety is on the line, she doesn’t accept weak compromises like other advocacy organizations in our city. But after years of donating her time for free to our cause, we need to be able to fund her efforts. And that’s why I’m asking you – in the midst of paying your holiday credit card bills – to please give what you can so Sam can continue to represent us in making our streets safer. Fortunately Sam isn’t alone in her efforts. She leads a team of volunteer members like myself, who also participate in public meetings and advocate on your behalf. Your voice is made much stronger by our collective efforts. For example, political candidates seek BikeSD’s endorsement for their campaigns. We see through the rhetoric of elected officials who urge residents to bike more for the environment, then cave in to parking lobbyists. And BikeSD is a non-profit organization, so every dollar you donate goes toward our advocacy efforts. Finally, for years I’ve read about people on bikes being seriously injured in our city, but in 2015 I was personally impacted. While riding downtown on our city’s bike share system (which operates on mostly unsafe streets), my husband was car-doored. He suffered a severe concussion and spent two nights in the hospital; he still hasn’t fully regained his sense of smell six months after the accident. Seeing someone I love laying unconscious in the street was shocking, and watching him suffer in a hospital bed only strengthened my resolve to fight. 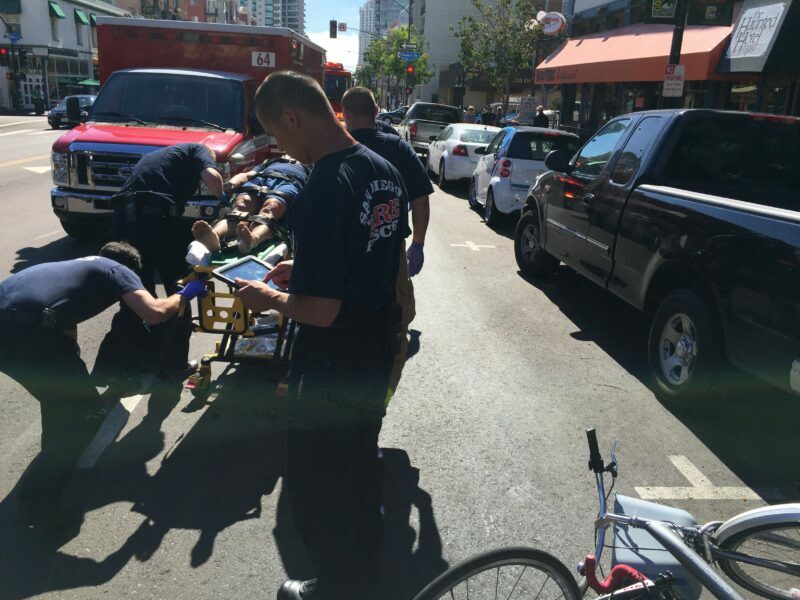 What if you or someone you love is injured as a result of our city’s failed leadership for safer streets? I’m asking you to take a stand to help ensure your safety and others who bike. Your donation to BikeSD can help make a difference for all of us.